Best Pizza in West Virginia: Our 10 Favorites! Who doesn't love a fresh, hot-out-of-the-oven pizza with toppings like pepperoni, Italian sausage, fresh veggies, herbs and spices, and mouthwatering cheese melting on top? With pizza styles ranging from New York, to Neapolitan, to Sicilian and stuffed crust, West Virginia can satisfy your preference! Find pizza you’ll love at these 10 great restaurants in the Mountain State. Buon appetito! The name pretty much sums up what you can expect at Pies & Pints in Fayetteville, West Virginia. Great service, a large selection of beer, and unique ingredients like grapes, gorgonzola, and rosemary, and before you turn up your nose, try the sweet and savory flavors that will make your mouth crave more. There are several locations around the state, so check their website for the one closest to you. Established over 70 years ago, DiCarlo's Pizza in Wheeling, West Virginia, serves its unique Italian-style pizza pies cut in square slices with a creamy provolone that's unmelted. Using only fresh handmade ingredients, diners are served by the friendly staff and service is quick. If you like the taste of wood-fired pizza, then Pizza & Cream in Nebo, West Virginia is worth trying. This popular restaurant won a spot on “101 Unique Places to Dine in West Virginia.” They bake their delicious pies in a brick oven and use only the best in-season ingredients like fresh basil, oregano, sage, and rosemary. They also have a signature ghost pepper cheese that will set your mouth on fire, but you can cool down with one of their homemade gelato or ice cream desserts or wash it down with a creamy milkshake. More than a typical buffet-style restaurant, Pizza Montese in Martinsburg, West Virginia, has an a la carte menu, too. Both choices offer delicious homemade selections like New York-style pizza and a variety of soups and salads. Hungry visitors can also choose from subs, paninis, and wings. If you're really hungry or you're feeding a crowd, you'll want to try the 24" Colossal Pizza that's a deal at the price. For a crispy pizza topped with bubbly cheese and piled high with toppings, you'll want to try a Mediterranean-style pizza from Vito's in Clarksburg, West Virginia. Celebrating the Italian heritage of the local area, these pies are made using Old World ingredients like black olives, olive oil, and a garlic-enhanced tomato sauce, then baked to perfection and served (or delivered) with a smile. It might take a little longer to get your pizza at Lorobi's in St. Albans, West Virginia, than at fast food joints, but the wait is worth it. Fresh, not processed, ingredients make all the difference at this popular local shop, and diners can choose between several specialty pizzas in addition to the traditional pepperoni and cheese. They only accept cash or local checks, so be prepared. Eat-in diners will enjoy the old-time surroundings in the 100-year-old steam ship office and fast, friendly service, but everyone will appreciate the variety of Italian specialties offered at Sirianni's Pizza Café in Davis, West Virginia. The parmesan wedges are a favorite, and you might want to try the lemon linguine if you're in the mood for pasta. With two Parkersburg, West Virginia, locations to choose, The Pizza Place provides New York-style pizza that some say is the best in a tristate area. With dough made fresh every day, only the best ingredients are used for their pizza, calzones, stromboli, breadsticks, and pepperoni rolls. They also have subs that include a pesto chicken sub worth trying. Whether you're dining in or ordering takeout, Graziano's in Charleston, West Virginia, will satisfy your taste for authentic Italian pizza. Their New York-style hand-tossed pizzas are prepared when you order, so they're fresh and hot. With several specialty pizzas like their Sicilian pizza with fresh tomatoes, garlic, and basil, sautéed onions, and mozzarella cheese, you can buy by the slice or a whole pie. Celebrating the unique Italian heritage and influence of the area by offering traditional ingredients, the pizza at Mia Margherita in Bridgeport, West Virginia, has another special difference. 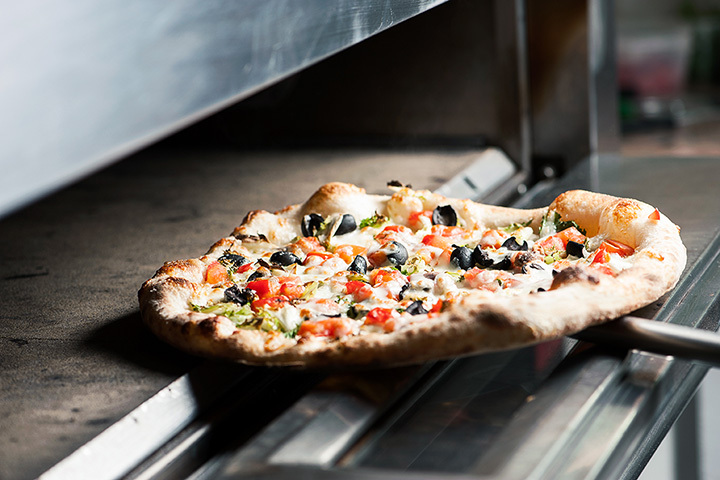 Each pizza is baked in a coal-fired oven in a centrally exposed part of the restaurant so diners can watch their pizza being made. The menu offers daily food specials and if you're concerned about dietary needs, they have vegetarian and gluten-free items, too.